Fr. Norbert Rigali, S.J., professor emeritus of the University of San Diego, passed away on October 4, 2017 at the Sacred Heart Jesuit Center in Los Gatos, California at the age of 88. Fr. Rigali was a professor of Theology and Religious Studies at USD for 37 years, from 1972 to 2009, where he held four terms as department chair. Having obtained his PhD in Munich and a licentiate degree (STL) from the University of Innsbruck, Fr. Rigali published more than 70 articles in English and German in renowned theological journals globally. His prolific writing earned him a place as one of the most widely respected theologians in fundamental moral theology. In 1999, USD dedicated a “festschrift,” which published a collection of writings on the topic of Roman Catholic moral theology in honor of Fr. Rigali’s years as a scholar. His writings will continue to inspire students and touch the hearts of future generations. While a professor at USD, Fr. Rigali taught courses including Foundations in Catholic Theology, Fundamentals of Catholic Social Thought and Foundations of Christian Ethics. His courses touched on a rich array of topics related to moral theology in a post-Vatican II era, including church teachings on war and peace and the progression of Papal Encyclicals such as Rerum Novarum and Laborem Exercens. Fr. Rigali was born on December 29, 1928 to Henry Alphonsus and Frances Irene White Rigali. Fr. Rigali grew up with six other brothers and sisters — two of whom joined religious orders, Cardinal Justin Rigali (Cardinal Emeritus of Philadelphia) and Sr. Charlotte Rigali (Sisters of St. Joseph of Carondelet). Having graduated from Loyola High School in Los Angeles, Fr. 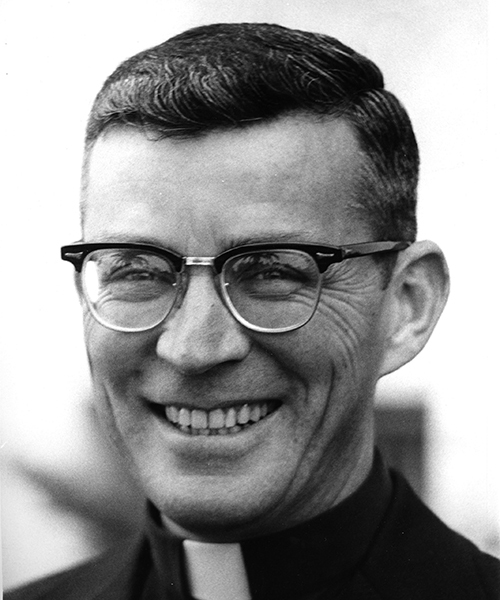 Rigali was a member of the Society of Jesus for 70 years, 58 of them as a Jesuit priest. Prior to his time at USD, he taught at St. Ignatius High School, San Francisco; Mount St. Michael’s, Spokane, Washington; Loyola Marymount University, Los Angeles; and the Catholic University of America in Washington, D.C. Fr. Rigali was also a research associate at the Cambridge Center for Social Studies, Cambridge, Massachusetts. While in San Diego, Fr. Rigali was a frequent visitor of the Missionaries of Charity’s contemplative house in San Diego, where he provided informative lectures on various theological topics. After retiring from USD, Fr. Rigali spent a few years at Loyola Marymount of Los Angeles before residing at the Sacred Heart Jesuit Center in Los Gatos, California. Even in retirement, Fr. Rigali continued to serve the Southern California community, having spent nearly a year as chaplain to the Vina De Lestonnac Convent in Temecula, California in 2013-2014. In addition to his brilliant mind, Fr. Rigali had the biggest heart. He was the epitome of humility and holiness, putting the needs of others first, including his students. Despite physical challenges in recent years, he always carried a smile and a blessing to all he met. Fr. Rigali put into practice that every human life is sacred and knew how, as St. Ignatius said, to “find God in all things.” It is no coincidence that Fr. Rigali’s surname is so close to the Italian “regali” which means “gifts.” It was truly a gift to know Fr. Rigali for more than 20 years and have him as a professor, spiritual advisor and friend. The great and sad mistake of many people … is to imagine that those whom death has taken, leave us. They do not leave us. They remain! Where are they? In darkness? Oh, no! It is we who are in darkness. We do not see them, but they see us. Their eyes, radiant with glory, are fixed upon our eyes full of tears. Oh, infinite consolation! Though invisible to us, our dead are not absent. Fr. Rigali once said that we don’t have to be perfect, we should just strive to be one step ahead of mediocrity. His exemplary life surely surpassed mediocrity, and he will be remembered by his students and all those who knew him for years to come. “Fr. 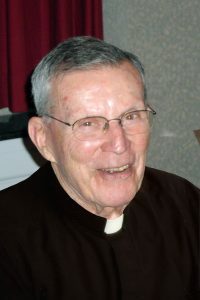 Rigali, or Norb, served as a Jesuit for 70 years and had a long and distinguished career as a professor of Catholic theological ethics at several academic institutions. His longest appointment was at the University of San Diego (1972-2009). I had Norb as a professor for several classes in Catholic theological ethics when I was an undergraduate at USD. It was largely through his inspiration, kindness, and influence that I decided to pursue graduate studies in Catholic theological ethics.